You wanna live a high life. You wanna party. 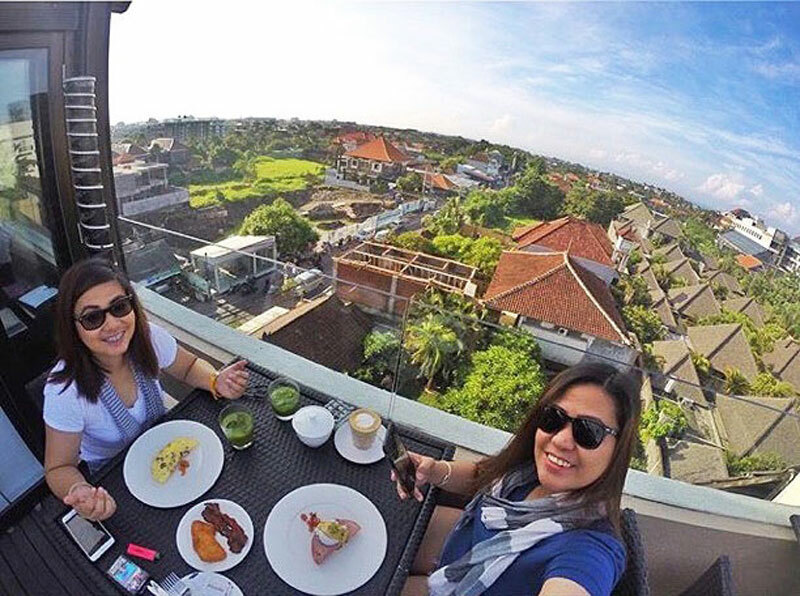 Where better to do that in Bali than at rooftop bars with the most gorgeous views? You will literally feel on top of the world. 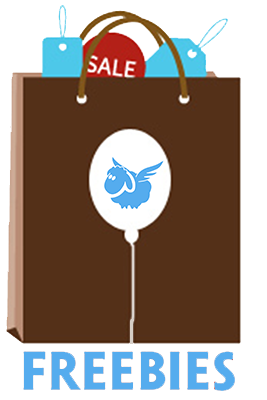 But with so many bars scattered all over the island, how do you know if you’ve got the best deal? Fret not, we bring you to the best places you can let loose and let your hair down. 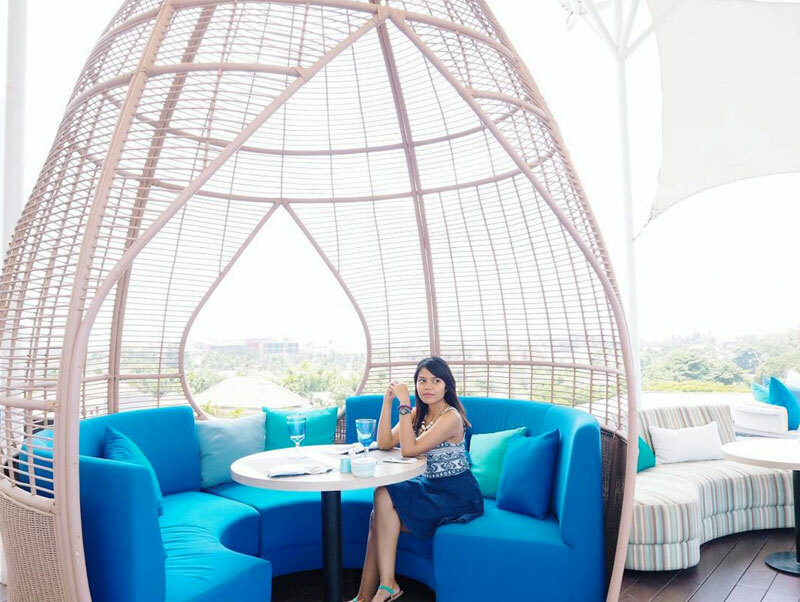 At BLU Restaurant–Bar–Lounge, blue is no longer a colour for sadness. 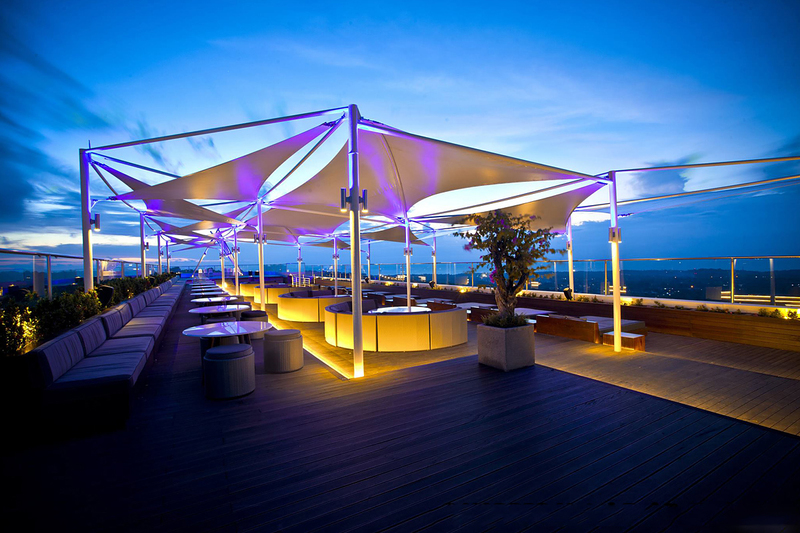 This rooftop bar is located right next to Golden Tulip Devins Hotel’s unique rooftop pool, but the blue of the cooling swimming pool isn’t the only thing you’ll be seeing. That’s right – the surrounding view of endless blue skies is all yours for the taking, thanks to the bar’s refreshing open concept. Even if sitting outside isn’t your thing, we think this place will change your mind soon enough. 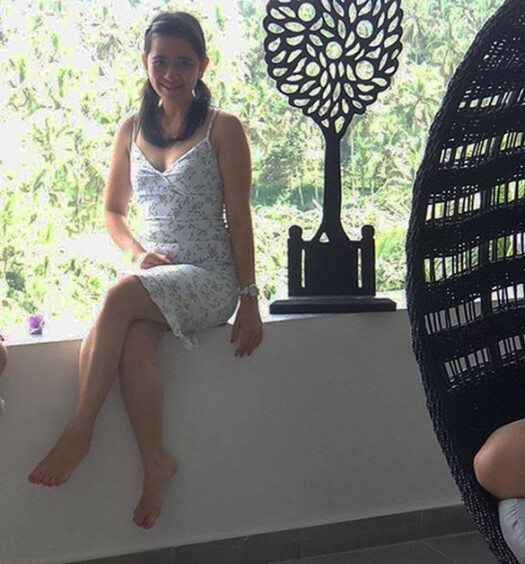 But, if it really isn’t your thing, you can still opt to sit at the indoor restaurant area. You won’t be missing out on anything, as the glass windows open up the place to equally amazing views for miles and miles. 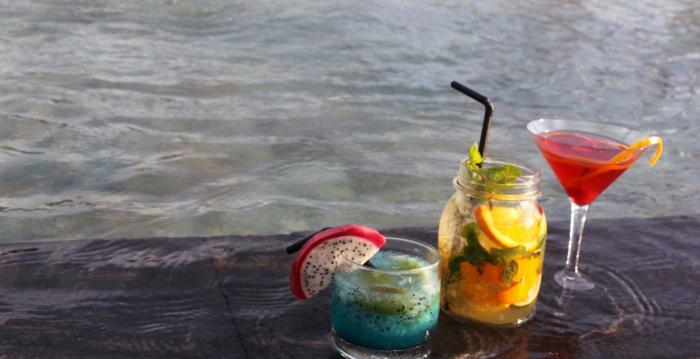 Just don’t get so busy staring outside that you forget to order your drinks! 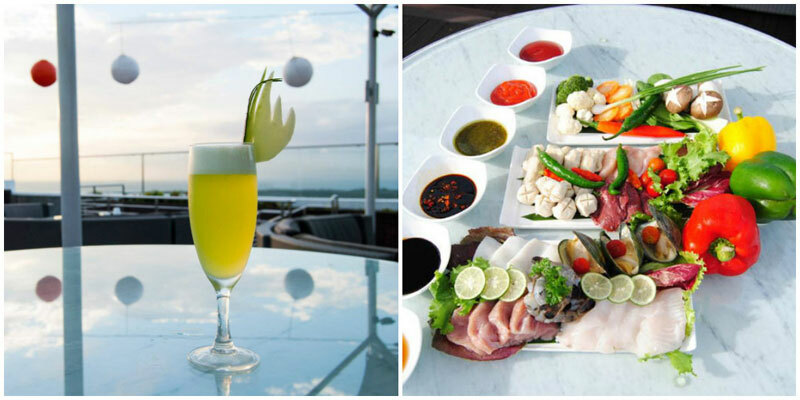 Other than sweet cocktails, BLU Restaurant–Bar–Lounge also has a series of yummy International and Asian cuisine available. Fill up with those gourmet burgers and pastas to save yourself from a hangover the next morning! 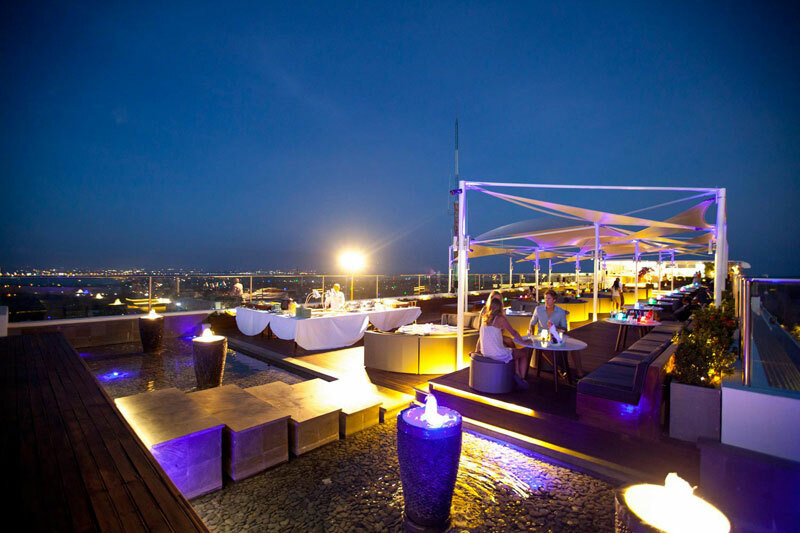 If you’re up for a more interesting night out with your buddies, then L Hotel’s Luna Rooftop Bar is a destination that you won’t want to miss. 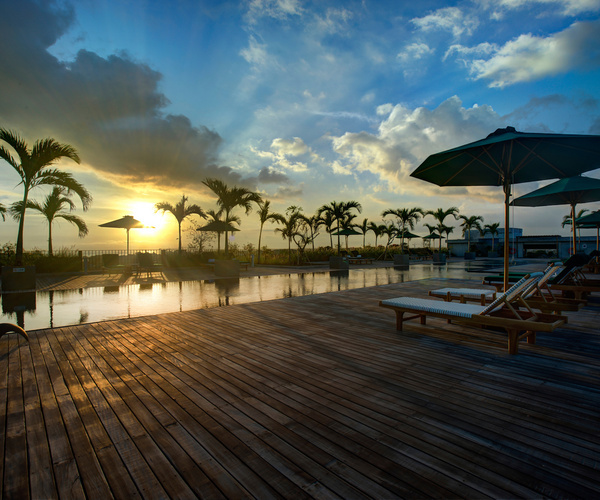 This rooftop bar not only features sweeping views of Bali’s skyline, but also the soothing greenery of paddy fields. Here’s where you’ll get to enjoy a good chat with your mates in a relaxed atmosphere, as you watch the chefs cooking it up at the open kitchen. Luna is also home to a series of unique cocktails, such as the “Twilight” (Vodka, Chambord and Berry Sugar puree) and “Luna Aqua” (Gin, Fresh Lemon, Soda, Cointreau and Lemonade). 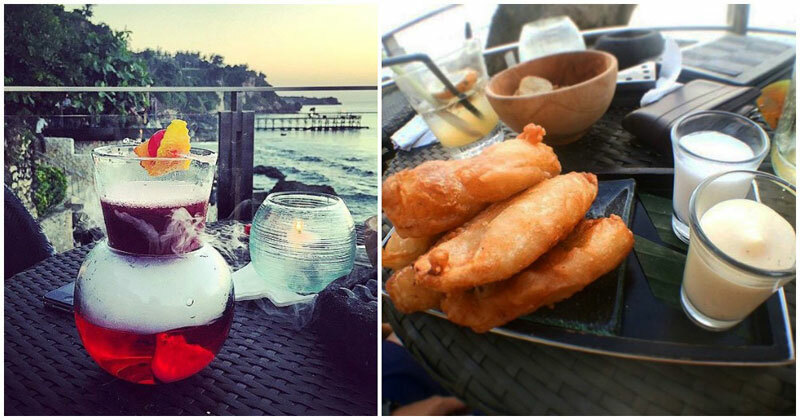 Plenty of other interesting concoctions are being made here everyday, so we don’t doubt you’ll find another reason to come back again and again. If anything, you’ll want to sample all the different vibes that this place has to offer. 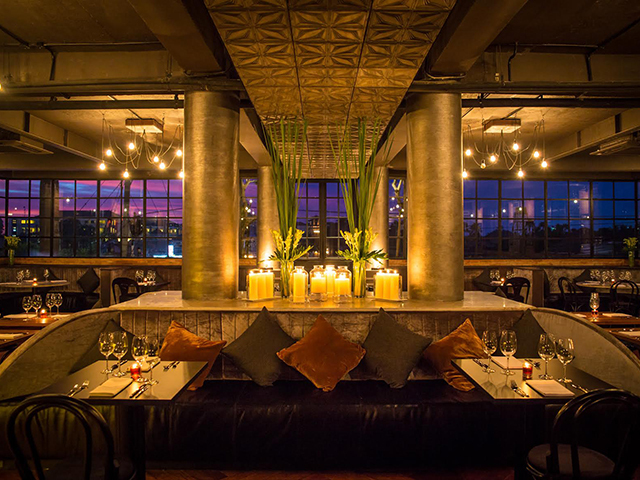 Other than the outdoor rooftop bar, Luna also has three private dining areas, each with its own identity. 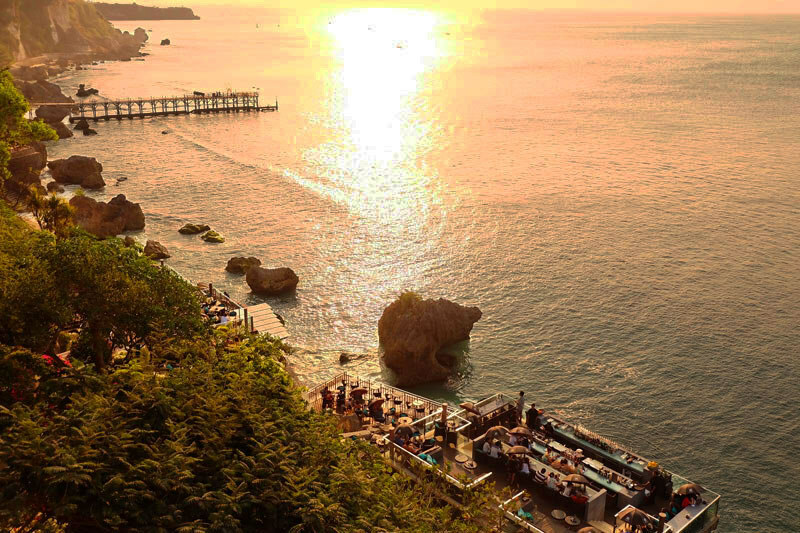 Tuck into some Japanese teppanyaki in Kitano, lounge in traditional Balinese Labu, or book a classy private room that sits 10 (in lush embroidered chairs!). 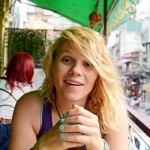 With all these experiences waiting for you, how could you be satisfied with just one visit? 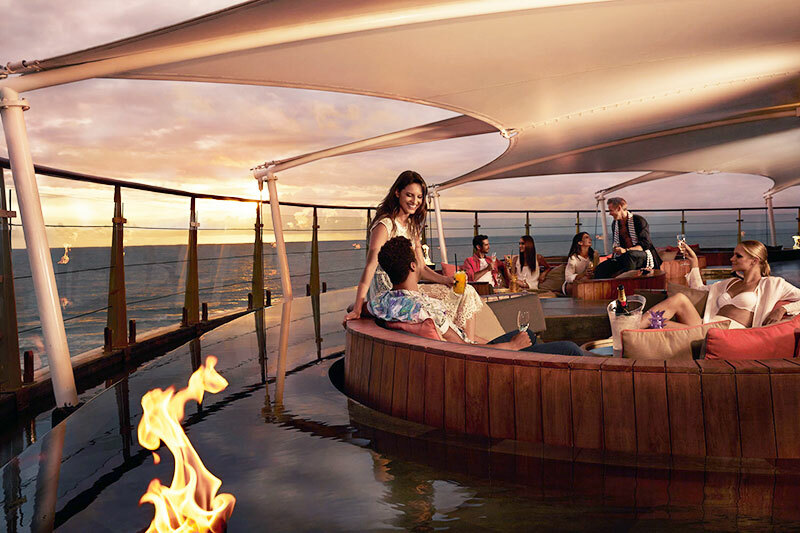 Ever wanted to enjoy the magic of a rooftop bar from a Jacuzzi? 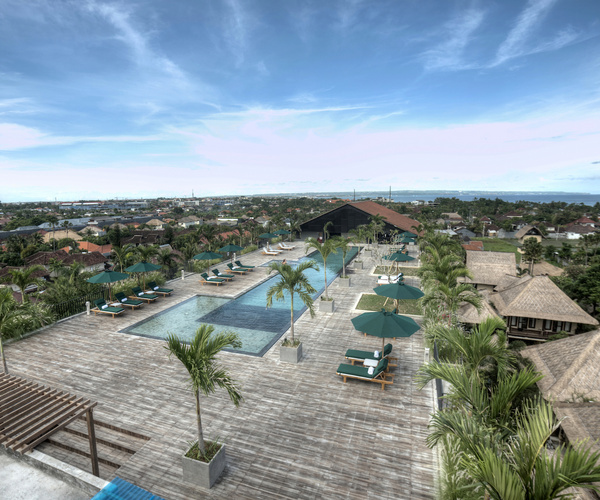 Vertical Point in Legian is the place for you if you love luxury and relaxing in warm foamy water. 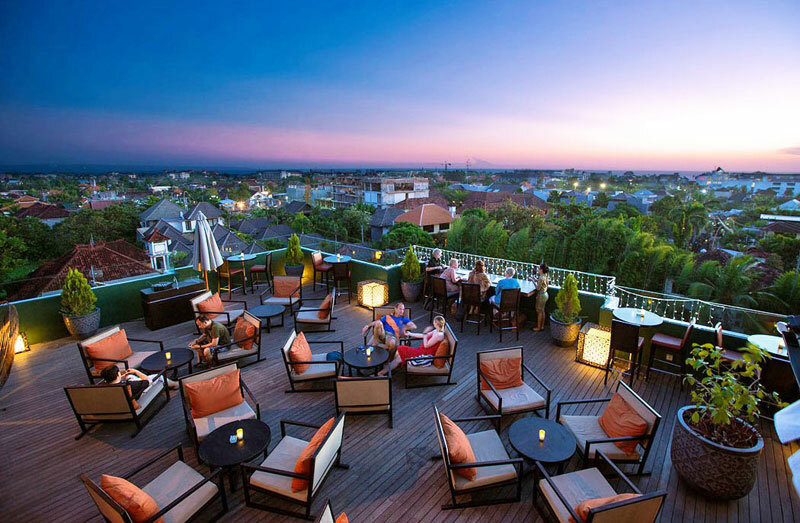 Hidden away at the top of the Akmani Hotel, this rooftop beauty is ideal for enjoying the sunset and weekend merrymaking. There’s more than enough space for you and your entire entourage to party all night long! 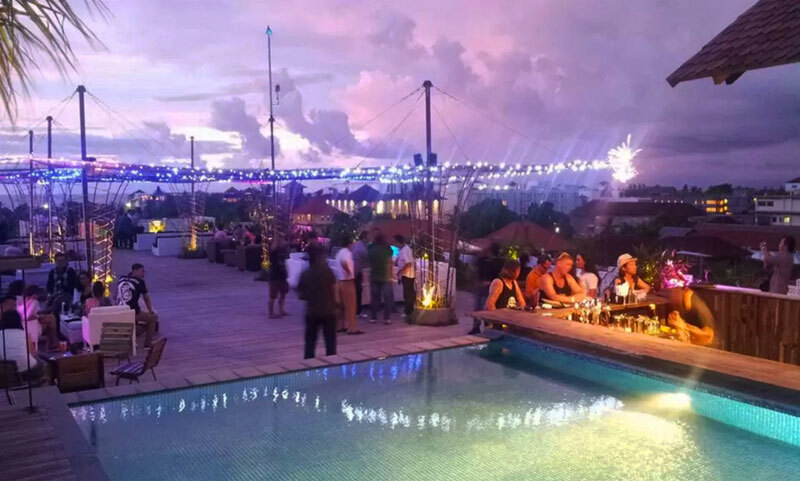 Jim’Bar’N at the top of the brand new Harris Bukit Hotel in South Bali may a tad out of the way for most party-goers who throng the Legian and Seminyak night scene, but it doesn’t mean that it’s any inferior. 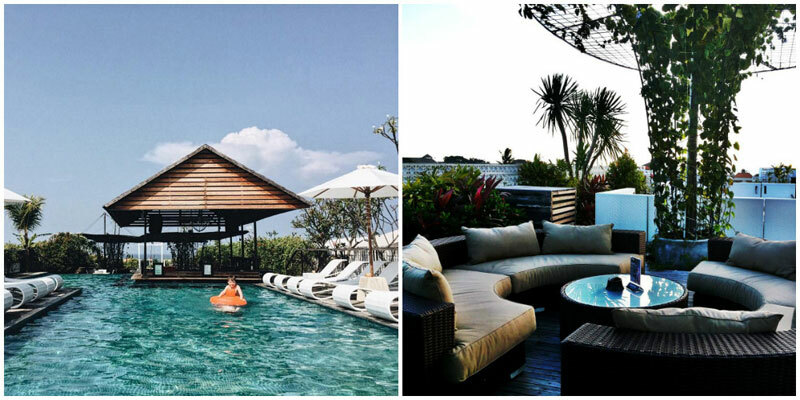 This hidden gem is, in fact, the highest rooftop bar in all of Bali. 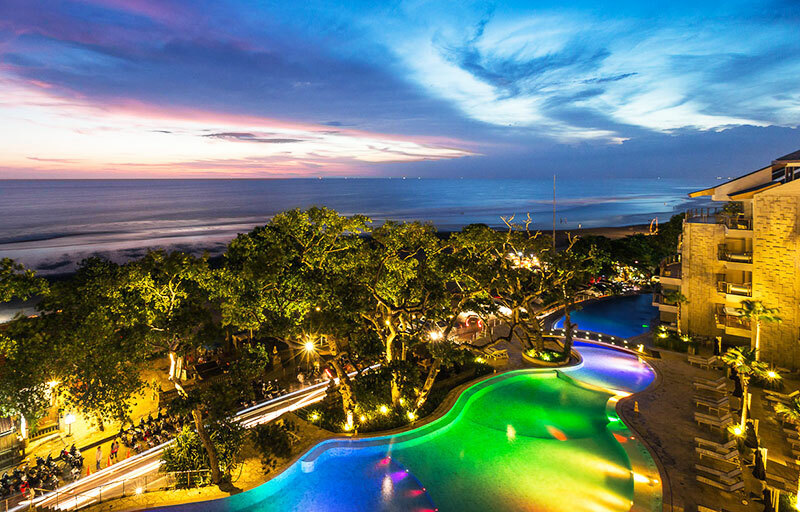 Not only will you be greeted with stunning 360-degree views of Bali’s amazing natural landscape, including Jimbaran Bay, but you can also tuck into a Mongolian Night Buffet, packed with fresh seafood, paired with chic signature cocktails. 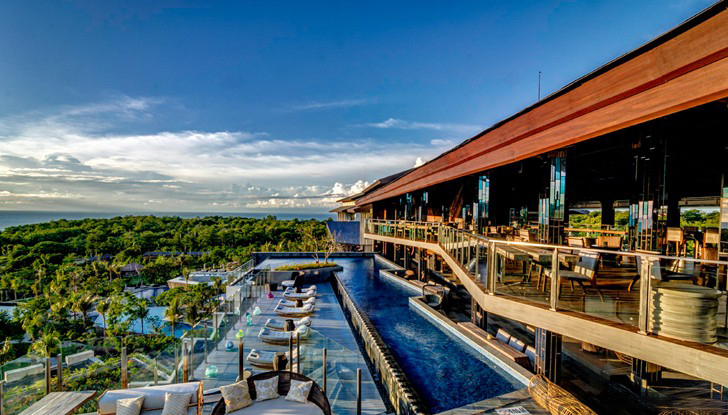 One of the most acclaimed rooftop bars in the island, UNIQUE Rooftop Bar and Restaurant at RIMBA Jimbaran (Ayana Group) was created by the same team behind the multi-awarded, Rock Bar. 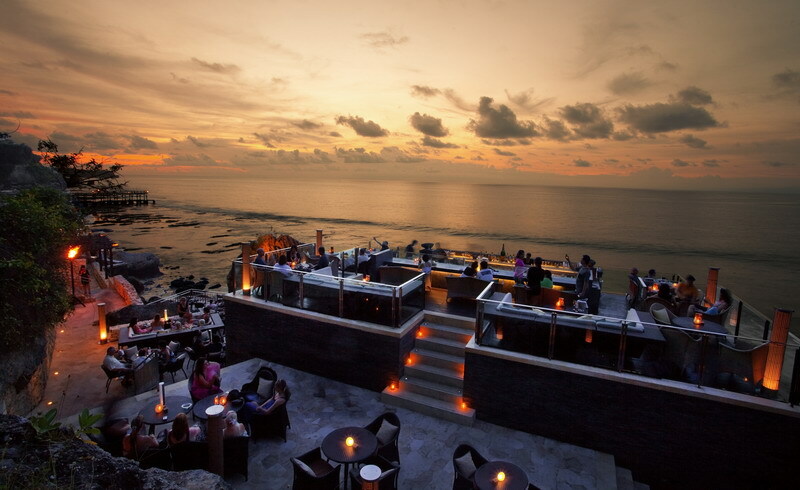 With a multi-level seating and a 25-metre infinity pool, the bar gives you an unobstructed view of the sunset, the hills of Uluwatu and the Indian Ocean. 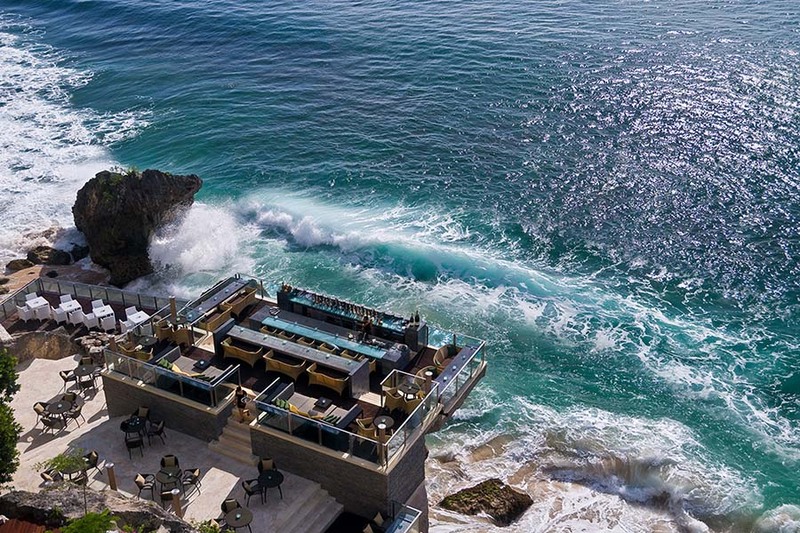 Where better to enjoy the view and sip your favorite cocktails at the same time? 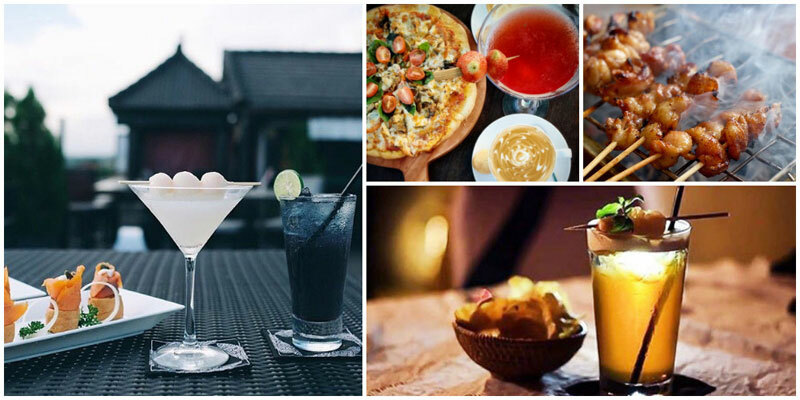 If you want something to munch on, UNIQUE specializes in Asian comfort food – Crispy Salted Pork Loin and Whole Tail Scampi among others to perfectly complement their great selection of cocktails, wines, and non-alcoholic beverages. 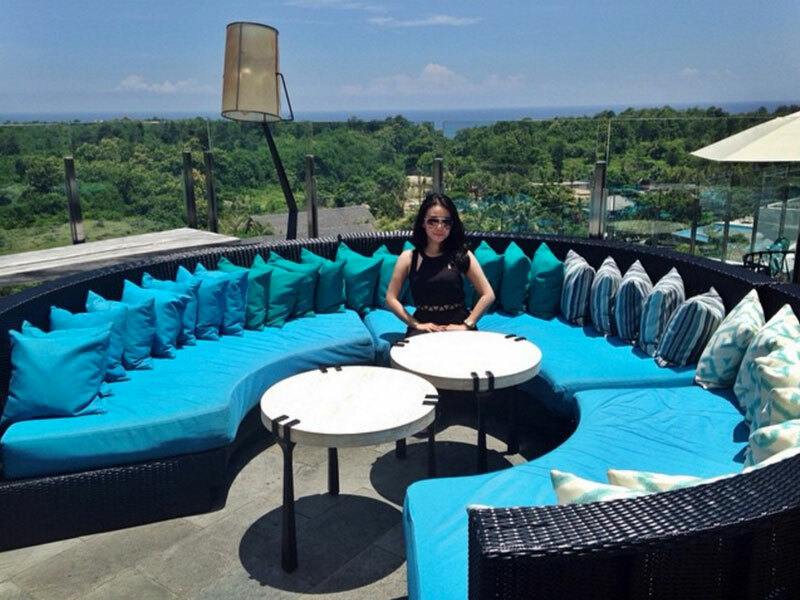 Be sure to order a cocktail or two and have your very own little cocktail party at this chic pool club. 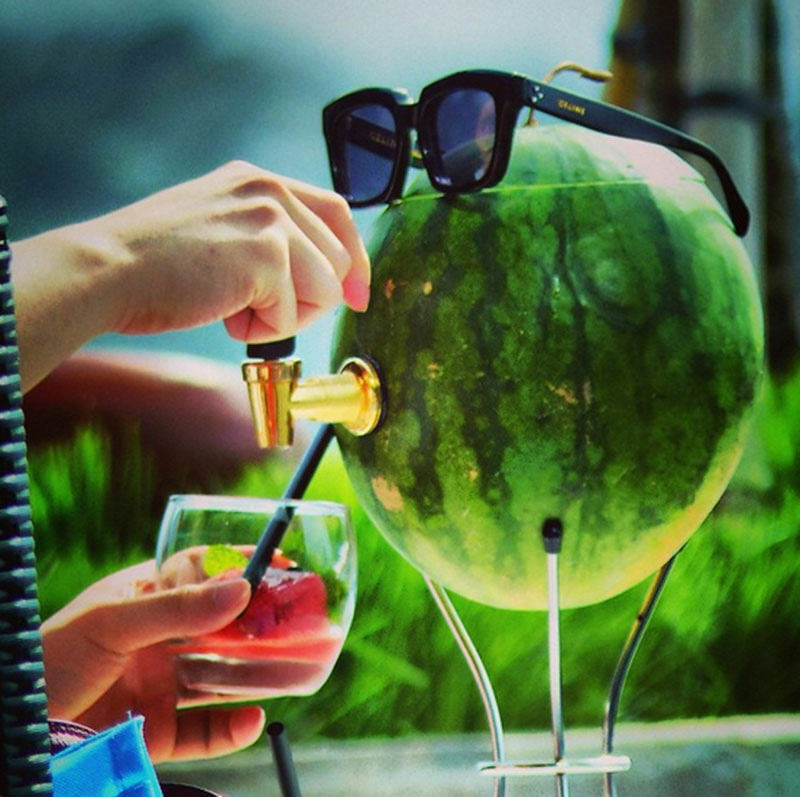 Or if you are looking for something truly UNIQUE, try their Watermelon on Tap – with vodka, orange liqueur, vanilla syrup and mint leaves served from a hollow watermelon shell. 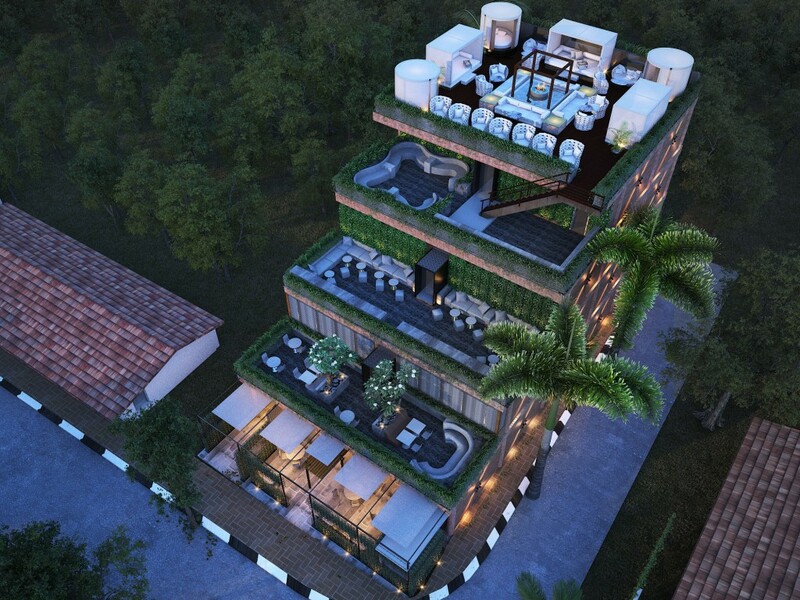 You can expect to be entertained, wined and dined at Double-Six Luxury Hotel. 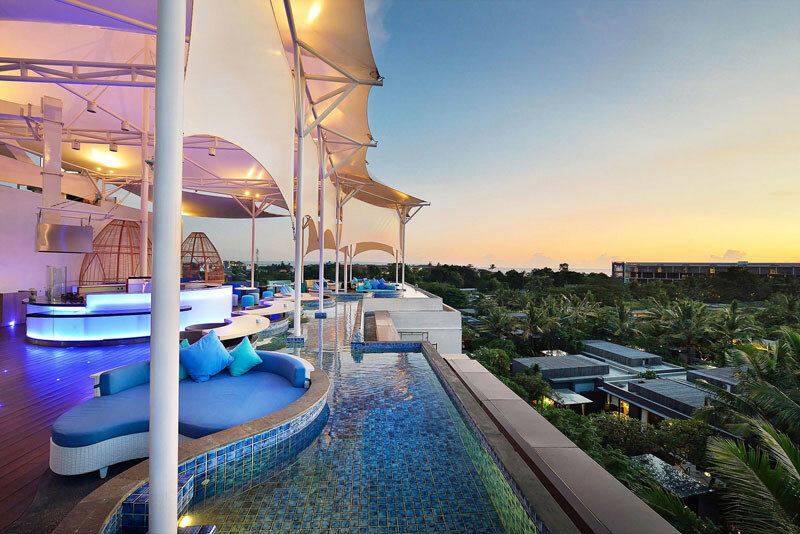 Standing at 1,700 square metres, Double-Six Rooftop is the hotel’s rooftop bar (and also one of Bali’s largest), where you can party every night. 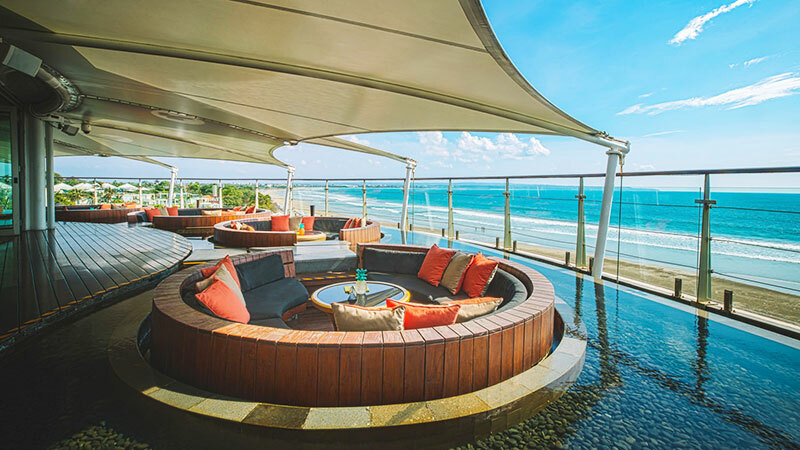 15 metres above sea level and overlooking Double-Six Beach, there’s plenty of view to enjoy as you sip on cocktails with a Balinese twist, listen to the DJs and relax in floating pods—circular benches surrounded by water. 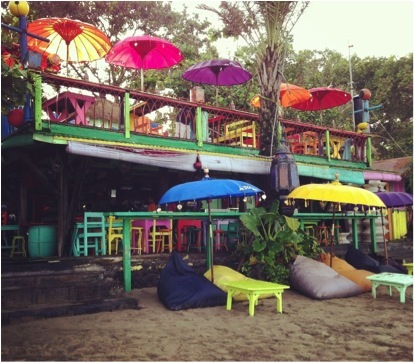 When it comes to rooftops, La Plancha is definitely not biggest bar on the block, but it may be the most colourful, decked with rainbow canvas parasols and painted little stools. Its quirky vibe already gives you a hint of who owns this Spanish gem – artists perhaps? 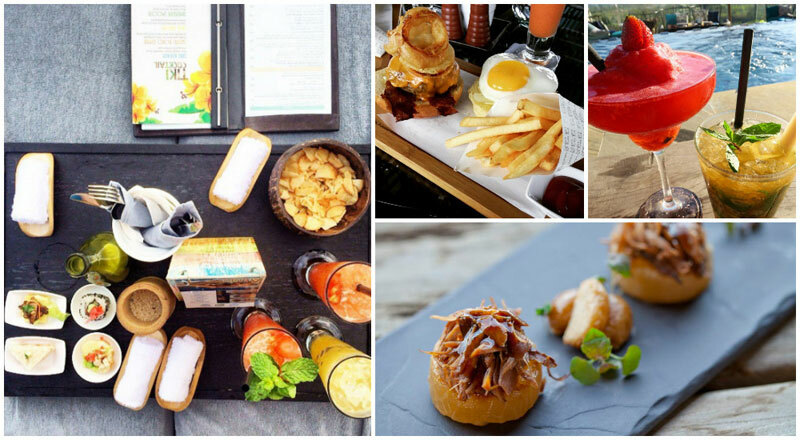 If you love all those unusual indie cafes, this is the perfect place for you. What better to spend the evening than laze on a beanbag with a Bintang brew or Peruvian cerviche, with a plate of La Plancha’s grilled tapas specials? 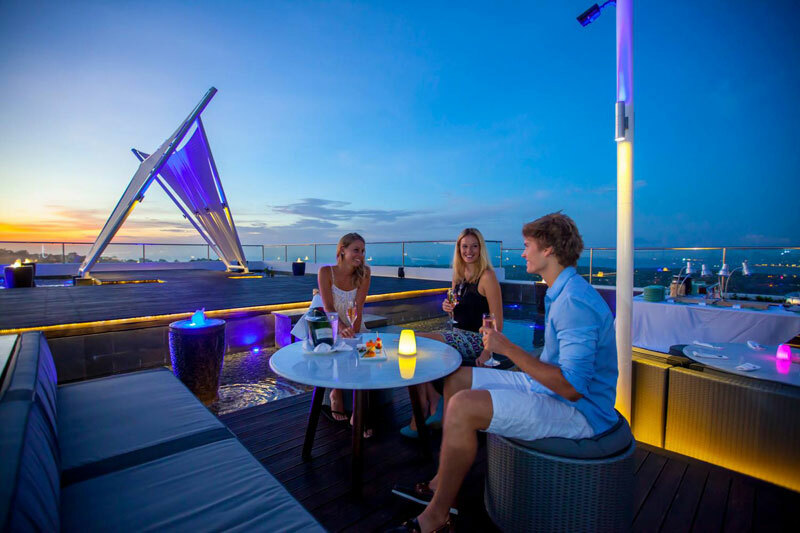 Minimalist, elegant, and innovative – these are some of the reasons why Ayana Resort and Spa’s open top bar has been hailed and awarded by various publications and travel groups. 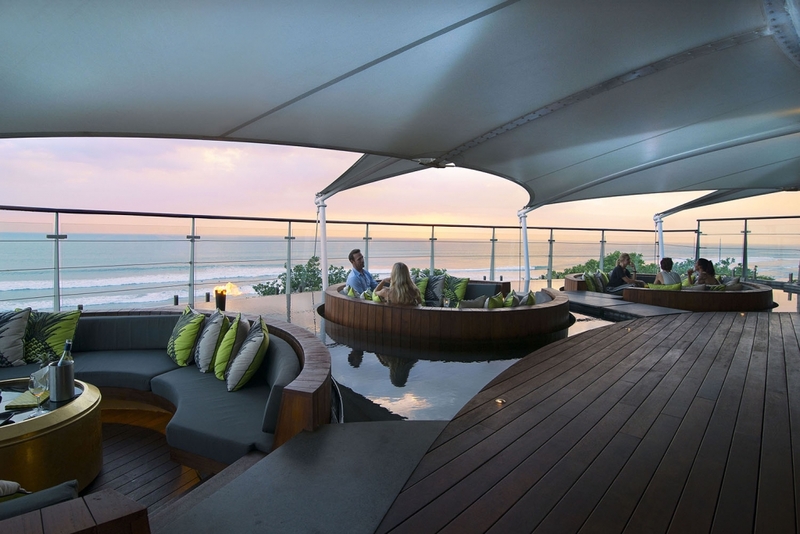 Rock Bar has an impressive groundbreaking location right on top of a rock along the 1.3-kilometre coastline of the resort. 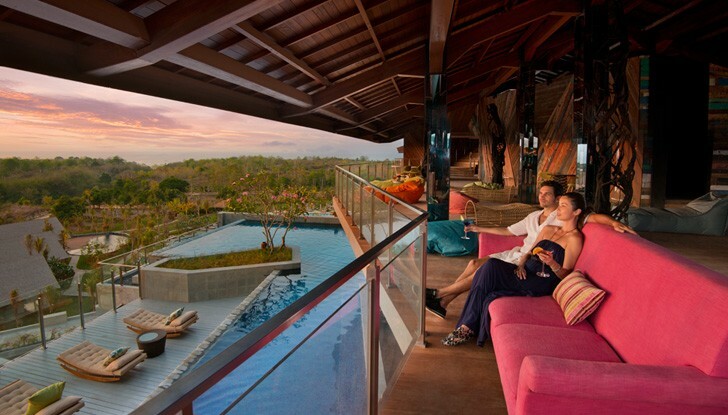 Open-air and elevated at 14 metres from the shore, you can actually enjoy a 360-degree view of the Indian Ocean. 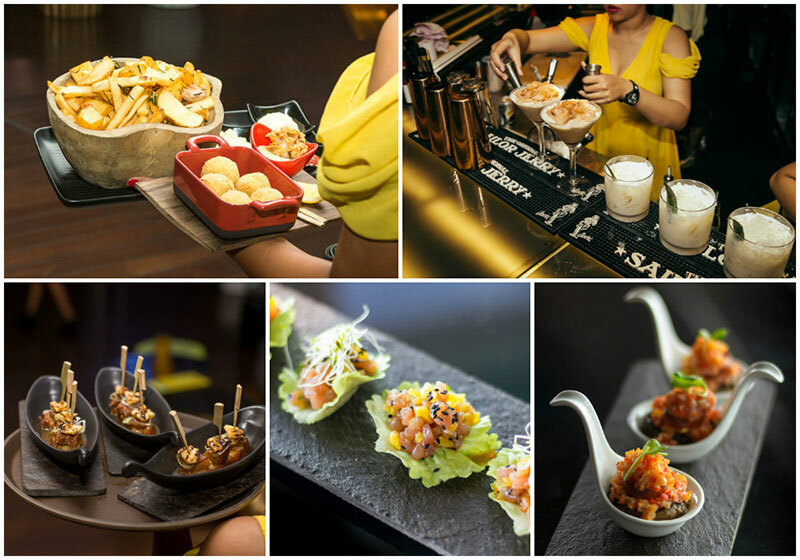 You must try the signature cocktails such as Rock My World (Vodka, Grapefruit Juice, Pineapple Juice, Grand Marnier, and Fresh Orange) and Hot Couture (Cognac, Hazelnut Syrup, Cinnamon Sugar, and Angostura Bitter), and pair them with finger food like tapas and lobster spring roll. What’s more, you’ll be well-entertained. Live acoustic band from local to international acts along with DJs lift up the entertainment at Rock Bar. The bar can be accessed via an inclinator, and can accommodate up to 236 people, with higher priority given to Ayana guests. To maintain its chic and elegant atmosphere, a dress code is followed. 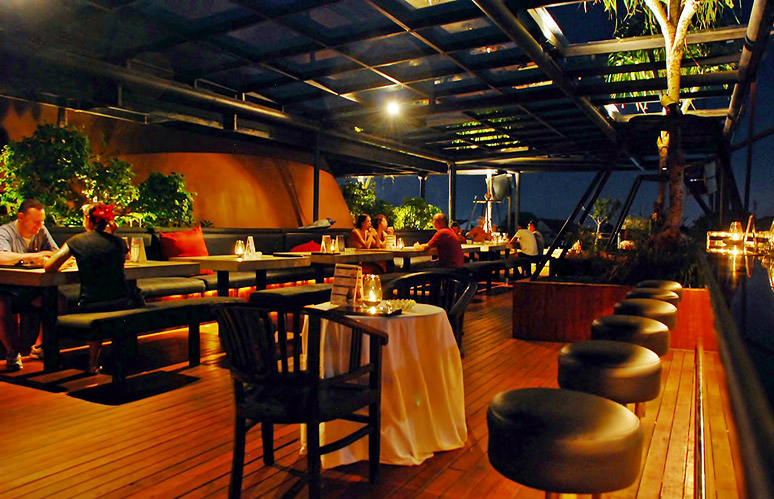 Never has there been a rooftop bar as generous as Skygarden in Legian. 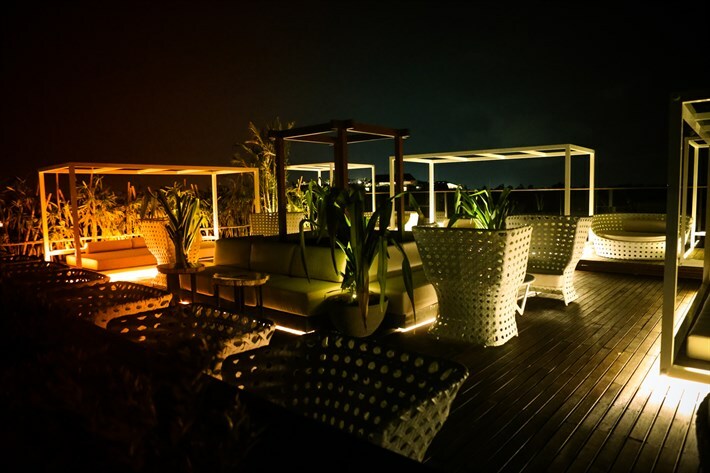 While others may charge for the privilege of their lofty environment,Skygarden invites anyone and everyone for an evening of eating, drinking and merrymakng on a gorgeous rooftop. 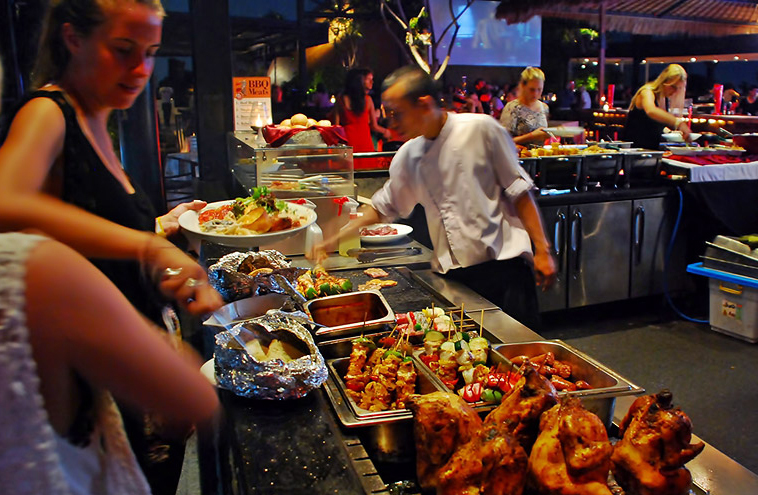 And for all these, you just need to fork out USD$5 for an all-you-can-eat BBQ smorgasbord, paired with free-flowing Bintang beer and a great DJ line-up. What more can you ask for? 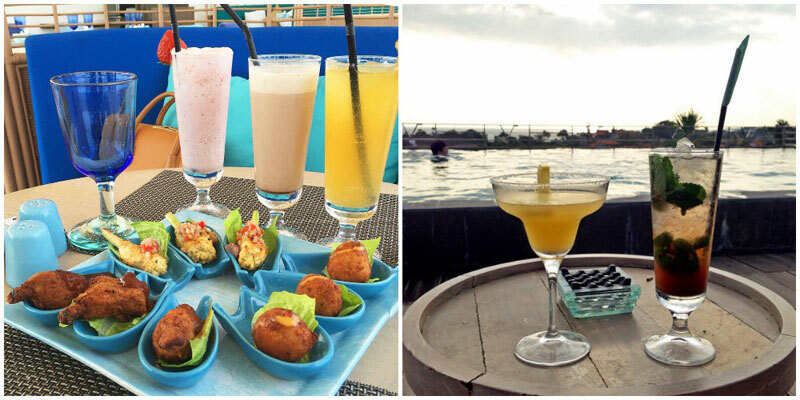 You’ll love lounging around the pool area with great food and drinks at U-Paasha’s pool and bar. The great rooftop pool is huge and surrounded with cushions, beanbags, and sun loungers – perfect for basking under the sun while working on your tan. Enjoy margarita, daiquiri, other cocktails. Light snacks are also served but don’t miss their homegrown “fresh fruit sorbet tea quenchers”. 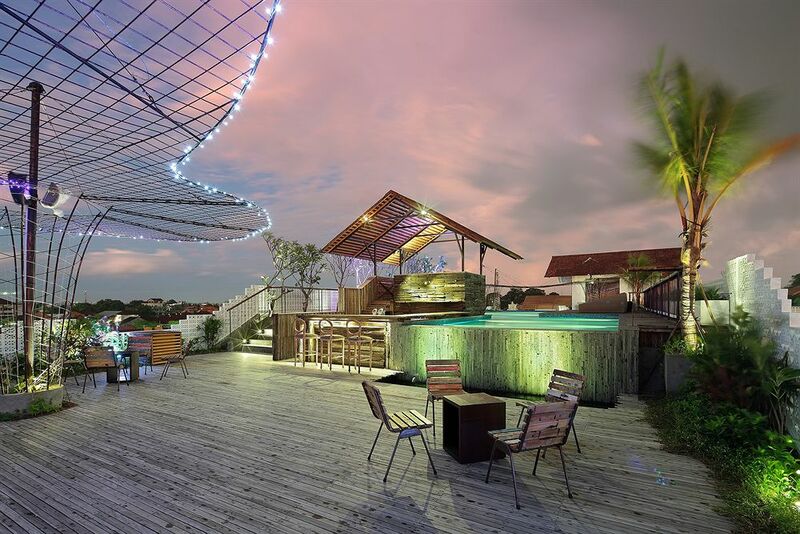 Visually, the bar is an elegant space with its wooden pool deck. 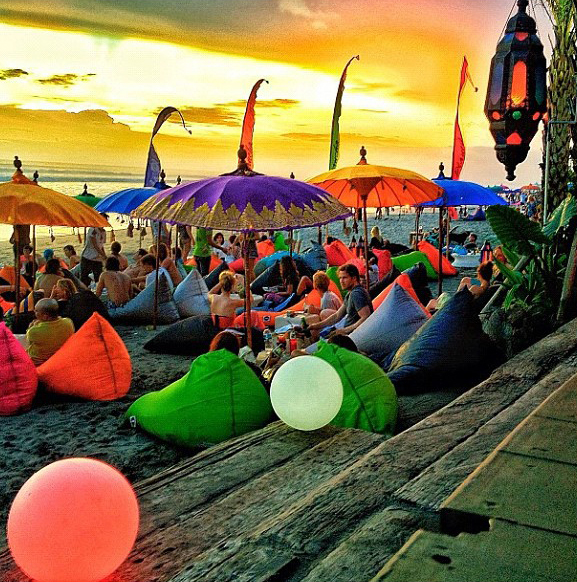 This is one of the best spot to enjoy Bali’s sunset, and to laze around at night with your family and friends with hip music and some well-deserved drinks. 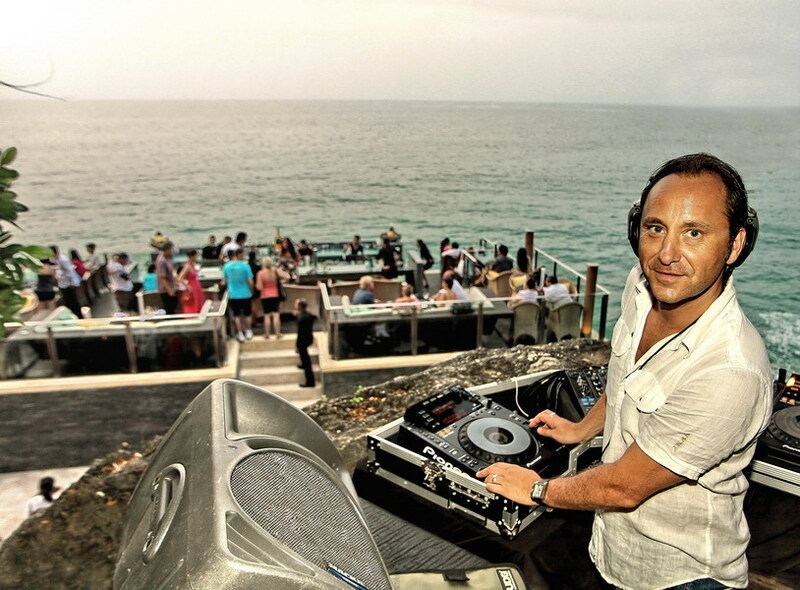 Townhouse in Bali is run by a 30-year veteran of New York’s night scene, and trust me, it delivers at every level. Stretching over four floors in a staircase-like building, Townhouse offers something different at every stage. Get your organic juice fix at Squeeze, before making a trip to the in-house photo gallery on the ground floor, where you’ll find the work of some of the world’s top photographers. 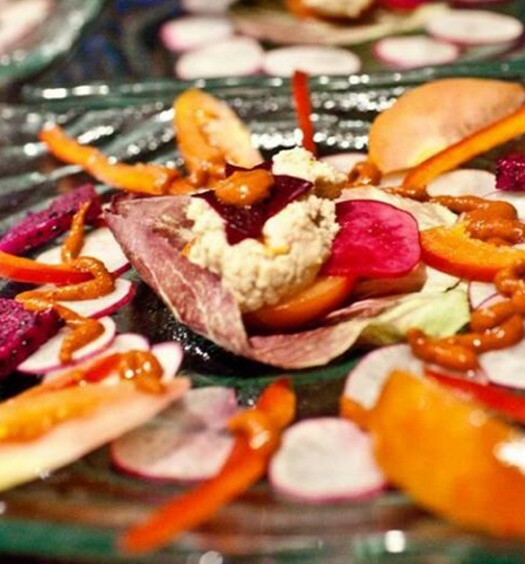 Find your tastebuds tingling for more food? 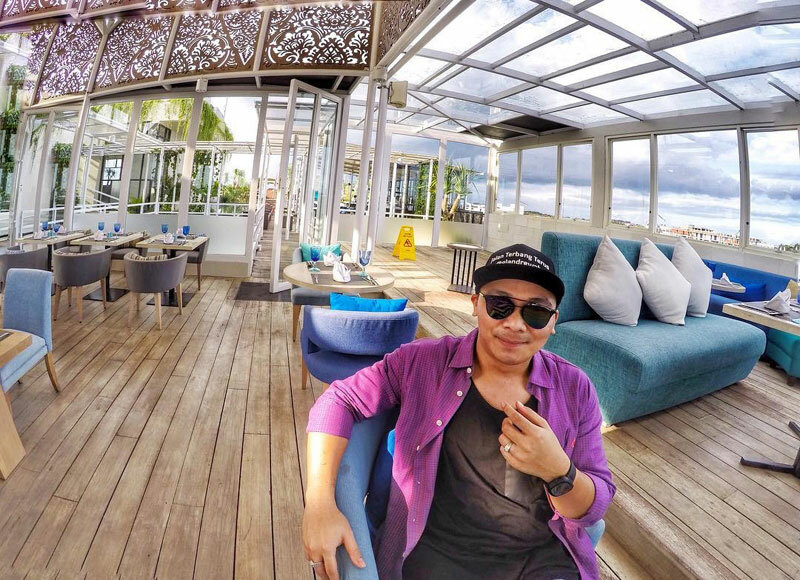 ​Head up one more level to Bistro for some fine dining, and revv yourself up to hit the dance floor at the Lounge, where you can start your evening rocking with an international DJ line-up. And that’s not even the end, yet. 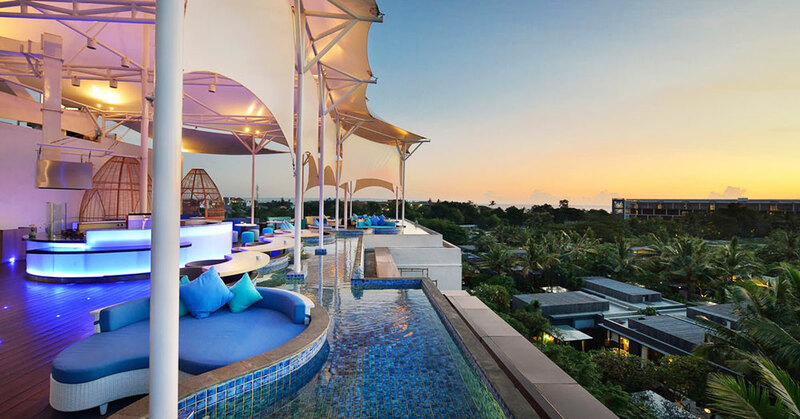 You shouldn’t miss the rooftop bar for anything – not only will you be rewarded with fresh air and a refreshing view of Seminyak, but you may also be tempted by their innovative cocktails, such as the Pineapple Diablo, created with local ingredients paired with quality international spirits. Now, what better way to end your evening? You don’t ever want the partying to end.